I love We’re Going on a Bear Hunt. It is one of the favourite books in my household and all three of my kids enjoy the fun, excitement and adventure of this story. When I heard there was a stage show I was excited but somewhat apprehensive. How do you turn such a classic book into a stage show? And can you really stretch the story out to entertain kids for a whole hour? The opportunity to introduce little people to the theatre was too good to pass up, so off I went to the Canberra Theatre with a very excited Mr Almost Three and Miss Seven in tow. I have to say I was impressed. The show only had three actors – dad, boy and girl (and a puppet baby), but they did a fantastic job of keeping kids engaged and entertained the whole way through. There was regular audience involvement and plenty of upbeat songs (and of course the Bear Hunt refrain, with a twist). The Bear Hunt journey was a clever blend of real adventuring and imagined around the house fun. For example, there was dancing through long strips of green crepe paper grass and exploring a cardboard box forest. My kids loved the handfuls of brown paint mud that the trio splattered on the waiting white canvas backdrops (as well as each other). 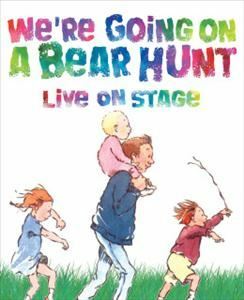 All kids love water, so when the bear hunters stripped off their shoes and socks to splosh through a river of water filled blue buckets, you could see the jealous audience leaning forward in their seats… And the subsequent squeals of delight when we were all squirted with water pistols! And, of course it wouldn't have been complete without…. The BEAR (don't worry, more cute than scary as he lumbers out of the cave)! Overall, this show provides a really positive first theatre experience for little people. It captures the humour, warmth and family togetherness of the original story, whilst engaging kids on a different level with the interaction, songs and make-believe. There was enough inspiration in that one hour to provide Miss Seven with a month's worth of craft activities to create her own bear hunt adventures at home. Presented by Canberra Theatre Centre and Garry Ginivan Attractions (Aus) in association with KW & NB Ltd (UK), 6 May 2017.